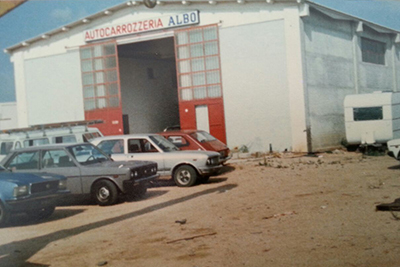 ALBO Car Body Repair, since 1932 in Olbia. 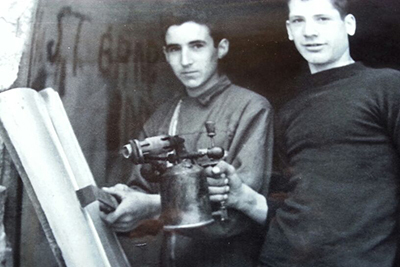 ALBO is probably the oldest car body repair firm still working today in Olbia and we have many pictures taken through several decades of our history, that we are delighted to post here on our web page and share with you. It’s a way of remembering where we come from and keeping the spirit of our heritage alive. 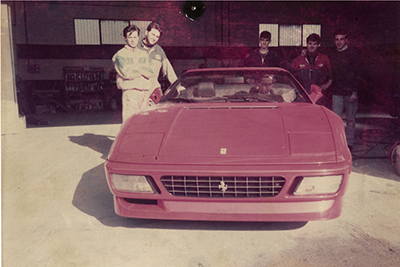 Our ample and modern facility in Via Giordania 21, in sector 4 of the Industrial Estate of Olbia, (see here map and contact details) is home to ALBO’s car body repair workshop with various equipment and machines, working spaces, auto body repair benches, polishing heads with aspirators, a spare parts department and, in the coating workshop, spray booths for paintwork drying. A spacious yard directly in front of the main building and another covered area inside the workshop itself is home to a parking and winter storage section, while the entire complex is enhanced by a modern and high-tech self-service car wash that customers can use even when the car body repair workshop is closed. The integration of all these various services can now supply an all-round cycle of car care: from repair to washing. A second self-service car wash facility has recently been opened near the Costa Smeralda international Airport, in order to provide service to tourists and car rental firms there. People coming to visit Sardinia over long periods need to have a car and due to the length of their stay cannot afford to resort to car-rental. In many cases, it is much more practical and safe to store a car in facilities which can provide not only protected surveillance of their premises, but also the possibility of providing car maintenance and care in the meantime. 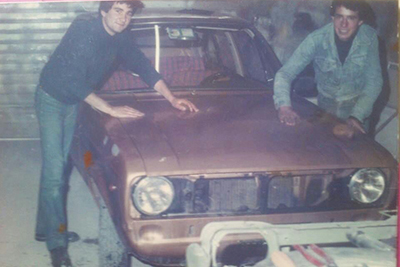 In order to cater for these needs ALBO Car Body Repair can provide ample parking space either in its vast enclosed open-air yard or in a covered sector inside our workshop, allocated specifically for storage. A true secured winter storage depot or, if you prefer, your own parking space just a few minutes away from the port and International airport of Olbia. Winter storage, as would be said in the case of boats; a place where you can keep your car safe and in working order until your return. Everything can be arranged according to your personal necessities to make this service a truly tailor-made maintenance and storage program. Call us for further information or to check availability and time schedules for this service.